Crete Paragliding. Find where you can paraglide in Crete, Greece. The perfect way to see Crete is paragliding or parasailing through the sky. The island of Crete is naturally windy taking the coastal breezes and making paragliding a perfect pastime in Crete. 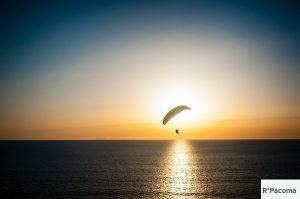 There are a few companies on the island offering Crete Paragliding service and usually in the area where the cliffs and hills are high enough to get a good starting vantage point. Here at holidays2crete.com we are a great fan of parasailing and have provided a few videos of parasailing or Paragliding on the island. If this isn’t enough for you then you can now bungee jumping in Crete with a new company that has just been established in Crete. anyway back to Crete Paragliding, it takes place on the south of Crete so booking a holiday in the Chania area is worthwhile if your coming to Crete especially to go paragliding. The main company offering this service in Crete is the Powerfly team at Tandem Paragliding they are fully qualified and accompany you, fly with you and get you soaring into the Cretan skies with vultures with stunning views over the beaches and mountains of Chania, Heraklion and Rethymnon. They follow a flexible daily programmes suitable for new and experienced fliers. They offer tandem para glides with the supervision of an experienced pilot. They also offer tandem paratrike again with an experienced pilot but this this is motorised and looks amazing. This company covers every eventuality and will try their best to accommodate your needs. If you are disabled or have any special requirements please let them know in advance and they can assign a pilot ot make sure you get to paraglide around Crete. If you have children who are fearless and want to soar around the skies of Crete on a paraglider then they also cater for children from 7 to 17 years of age with an experienced pilot. There was a few instances of sky diving in Crete but since 2014 no company has carried on offering them. In 2014 there was a jump near Maleme airport but we have done research and found no other company offering it. We hope one day a company will start again Sky Diving in Crete and when they do we will update the page with their details. The company SkyDive Crete used to do Accelerated Freefall (AFF) and tandem jumps near Maleme but as mentioned they have since stopped. If you were to get to jump over Crete its normally at 12,000 feet in the tandem dive with an experienced instructor where you would’ve experienced breathtaking views over the entire island. If you enjoy extreme sports in Crete and you would like to share with other visitors to the island then we are always looking for new contributors to the outdoor articles and guides.